Mini Meringue Eclairs With Cadburys Creme Egg Filling. 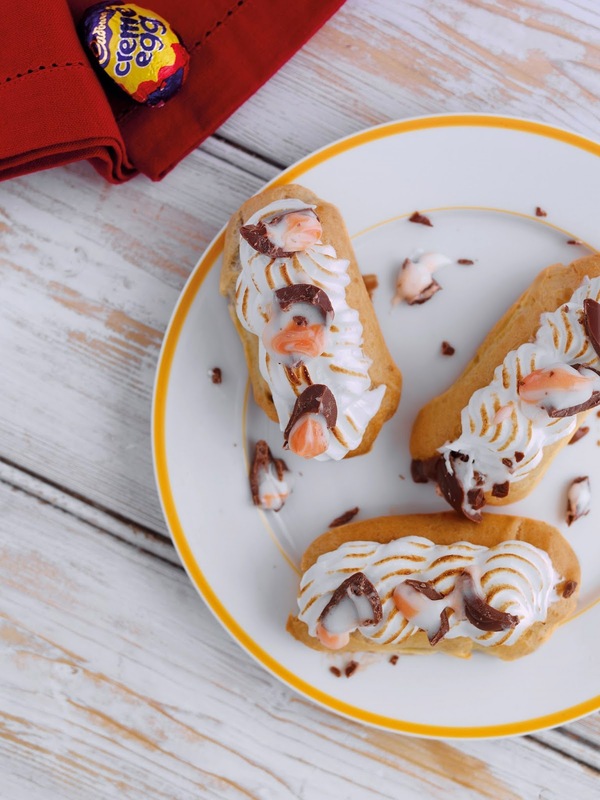 Fancy making these Mini Meringue Eclairs With Cadburys Creme Egg Filling? 1. Preheat the oven to 225 degrees. Put the water, salt and butter in a saucepan and place it over a medium heat. 2. Bring to the boil, stirring occasionally then turn off the heat and add the flour all at once. Stir immediately and vigorously with a wooden spoon, until the mixture forms a loose ball and comes away from the sides of the pan. 3. Place the pan over a low heat and stir constantly for about 30 seconds. Transfer the dough to a mixing bowl. Using a hand-held electric mixer fitted with the beater attachments, stir the dough on low speed for about two minutes. 4. Add in the eggs one at a time, letting each incorporate fully before adding the next. Check the consistency of the dough: it should be smooth and glossy and, when you touch the surface, form a medium-soft peak. 5. If the dough is too thick, add in more egg a little at a time; whisk the fourth egg and add it teaspoonful by teaspoonful. If needed, add the fifth egg (or part of it) the same way, until the consistency is correct. 6. Put the dough into a piping bag fitted with a plain tip that’s 1cm in diameter. Line a baking tray with baking paper. Pipe the dough into éclairs that are about 10cm long and 1.5cm wide – you will have about 15 of them. Leave room between them so they have space to expand. 7. Bake at 225 degrees for 10 minutes then lower the heat to 200 degrees and bake for 10 more minutes, or until done. When ready, the éclairs will lift from the baking paper without sticking, and be well puffed, golden and firm, with no soft spots. If they’re not ready, turn the heat to 180 degrees and continue to bake. Let the éclairs cool before filling them. 2. Meanwhile, in a large bowl, whisk together the egg yolks and caster sugar until they turn a pale colour, then whisk in the flour and cornflour. Pour on the milk, whisking continuously, then pour back into the pan. Whisking constantly, bring back to the boil over a medium heat and cook for 1 minute. Pour the crème patisserie into a bowl. Cover the surface with a light dusting of caster sugar to prevent a skin from forming and leave to cool. 1. Use the crème patisserie, which you made earlier. Melt the Cadbury Creme Eggs in a bowl and pour into the crème patisserie. Add the cocoa powder and whisk until the mixture becomes smooth. Transfer the mixture to a piping back with a 5mm nozzle. Make a hole in one end of the éclair and pipe through. Mini Meringue Eclairs With Cadburys Creme Egg Filling. Recipe courtesy of Cadbury Creme Egg. Meringue Nests With Passion Fruit Coulis And Cadbury Creme Egg Ganache. Grilled Banana Boats With, Pecans, Marshmallow And A Gooey Cadbury Creme Egg Ganache. "Beautiful Colours Of Spring: The Wednesday Blog Hop"
"Asparagus And Pimento Cheese Puff Pastry Twists"
Look at that! Loog great and I bet it tastes even better, Claire..